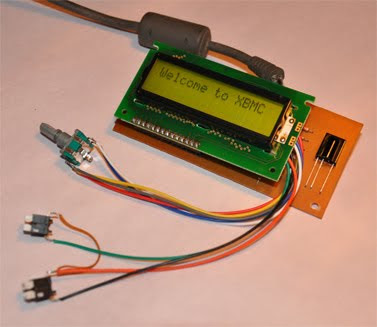 In this project we develop USB port base controller for XBMC application. Main functionality of this controller unit is to provide remote control interface, LCD base - player information panel and rotary encoder base controller for XBMC. With this given hardware design and software programs, user may be able to control XBMC without using standard input devices such as keyboard and mouse. This device is design to work with XBMC Version 10.1 (codename Dharma) or newer versions. Older version of XBMC may not work this system because of the differences in its Web Control Interface. PIC18F4550 is a main hardware controller of this system. This microcontroller is used for USB interfacing, as LCD driver, IR base remote control data decoder and as a driver of the other input devices (such as rotary encoder and push switches). Controller’s USB interface is design to work as USB HID class device. This system is design to work with Microsoft Windows Operating Systems and we test this system in Windows XP Professional editions and some few Windows XP embedded editions also. Nice project! I would like to make one of these for the xbox1. How do you suggest I build a controller like this one to send commands to the even server on the original xbox. I am making a music jukebox.